The theme of is new album from Mirt is "derived from exotic vision of class B old adventure films and cheap comic stories". The musical result is an attempt to obtain a crossover between a pop song structure and some experimental effort to obtain the typical atmosphere of sci-fi and adventure movie, the first genre to historically feature electronic and experimental music. The first side is opened by "Disaster", a track focused con dreamy lines of synth and found sounds. "Soul" is instead a proper pop tune with vocals even if it's more structured than the average. "Papa Legba" closes the side with an almost meditative mood created by the loops and the oriental beats. Side 2 opens with "Bury Me Here" a soundscape created with a sparse noises, a drone and some effects. "Hunger" is based on the juxtaposition of a glitchy beat and a textured sonic landscape "South" closes this release with the dreamy synth and a beat created with the baseline. Some lines could be a sort of "looney tunes" but, as the linear notes stated, this has been consciously done searching for this kind of mood. It worths a listen when it's not season for avant-garde but for something to hear while reading a comic book and drinking a wine. Nice. 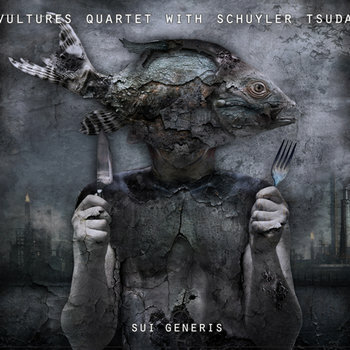 This recording is the result of a collaboration between Vultures Quartet, that seems a trio, and Schuyler Tsuda and is the result of a series of recordings made while playing with vintage analogue synthesizers, various orchestral instruments provided by University of Minnesota. After various listening the result reminds, in some sense, to the experience of the first AMM albums in their use of noise and drones for the creation of a musical universe, in his dialogue with silence, rather to the creation of a sound barrier. The first track "Narc By Accretion" is based on the dialogue between the electronically generated noise and the subtle metallic sounds barely audible in the silent moments of the track. "[Sic]s"is a mostly quiet development of small sounds while "Three Folds For Desmond Briscoe" returns to thick masses of sounds that introduce the juxtaposition of metallic beats and percussion above a soundscape. "Ostia" and "Max Enrst In Arizona" are evocative tracks with the musical development of his small and noisy musical lines. "Ire_Xeno_Ire" is an alternation of silent sounds and sharp drones. "Halo, Then Rhetor" creates a soundscape with the layers made by the four performers while "Dead Hen At Ipatiev House" end this release quietly with carefully constructed textures and sound sculptures. This quartet has developed a way of playing that could sounds as without form but, as AMM years ago, is able to be almost polysemantic and so every member is part of a whole even with his unique voice. This is a wonderful release but perhaps could only be fully appreciated by curious ears of EAI fans. One of the most suitable Japanese word to translate "joy" or "delight" is "yorokobi", whose kanji transcription is made up of a couple of words, literally meaning "rejoice in beauty" or "take pleasure in beauty". Such a concept which involves both emotional and aesthetic aspect perfectly fits to the third compilation album by renowned Tokyo-based label Schole, which follows the successful self-named first compilation (sold out) and the second one titled "Note of seconds" and doesn't lose to deservedly celebrate its 5th anniversary by a bunch of 13 delicate tracks with different emotional declension of what we name "joy": the lovely melodic baldness of Akira Kosemura's "Joy" - that kind of song some listeners could use as a soundtrack for the videoclip of the first final recital at school of your little son, the first dance display of your daughter or a memorable country outing with your family! -, the subtle connections with French pop songs of the initial whistled "Beginning" by Mamerico, the gentle chromatic whirlgigs and the delighting cherafic choir of "Irodori" by Yoshinori Takezawa, the enchanting ascending clockwork of "Air" by [.que], the acoustic-guitar-driven representation of the spirited jollity of a group of pupils on "Welcome To My Playground" by Humminbert Stereo, the balletic intertwine of guitar, piano and female voice of "Evergreen" by Akira Kosemura, [.que] and Lasah, the explosions of ethereal tenderness of "Imagine Fun" by no.9, the exquisite pianistic cammeo of "Short Story" by Quentin Sirjack, the daydreaming musical box of "Day Light Dream" by Sawako and Daisuke Miyatani, the dissoluble listening pearls of the mesmerizing "Santiago" by Ghost And Tape, the perfumed drops of minimal chiming piano of "Incense" by Teruyuchi Nobuchika, the charming guitar ballad of "Light Dance" by Paniyolo and the folkish portrait of "Anne" by Haruka Nakamura. I'm pretty sure many listeners will easily enjoy these delightful musical miniatures, which anticipate forthcoming directions of the label as well. Building upon the dubstep-dabbling introduced in their previous release, 2012's AirMech, a soundtrack to the eponymous real-time strategy video game, Front Line Assembly's 18th studio album, Echogenetic, reflects a blend of experiments in dubstep and FLA's classic electronic body music sound. Each FLA fan has their preference and opinion on what constitutes FLA's best work, whether the early era of conventional, classic EBM (such as Initial Command and Corrosion), metal-influence and guitar sampling (such as in 1994's Millennium, and to a lesser extent, 2010's Improvised Electronic Device), albums bordering on techno, or the melodic, danceable EBM introduced in 1992's Tactical Neural Implant and heard in various albums since. Accordingly, every fan is likely to have a different opinion on Echogenetic. Dubstep-influenced beats and structure are heard throughout Echogenetic, such as in tracks "Leveled," "Deadened," "Exhale," and "Prototype." These elements are not omnipresent, thereby ensuring Echogenetic holds one's attention and remains listenable throughout. The introductory, bass filled track is the dark instrumental "Resonance," which ends on a dramatic and sudden note to transition into "Leveled," which jumps right in with the syncopated beats that characterize the dubstep genre. Leeb's effected vocals in this track, and indeed, throughout the album, are rather reminiscent of Tactical Neural Implant-era FLA. "Leveled" stands out as a surprising track, its mood temporarily lightened in an otherwise dark song with around a minute of minimalistic keyboard in a major key in the middle of the song. This type of juxtaposition is not an uncommon element in FLA's music, and while a bit disorienting this early in the album, it somehow works and prepares one for more surprises later. "Killing Grounds" sounds as though it could be the industrial music anthem for 2013. It is a pounding dance track with repetitive vocals and more sound- and vocal influence from Tactical Neural Implant, particularly in the breakdown. This track is among the highlights of the album, along with the hauntingly (no pun intended) sorrowful and beautiful "Ghosts," which incorporates synthetic strings and vocoded effects. The band re-visits the somber sound later in the dramatic "Exo." "Blood" is undoubtedly the catchiest track on the album due to the hook in the lyrics of the chorus: "You've got blood in your eyes / you can't see past your lies / You are the one you desire / Because you've got blood in your eyes." The title track is the most dubstep-heavy on the album. The album then concludes with "Exhale," another danceable track ready for gothic-industrial club play, and "Heartquake." Not the strongest track, "Heartquake" nevertheless literally winds down the album nicely. Overall, Echogenetic is a very strong, well-produced, and riveting release, arguably among the strongest Front Line Assembly albums in the past decade. While dubstep has largely become stigmatized, particularly due to the criticism it has received since breaking into mainstream music since 2009, Leeb and his collaborators continue to be talented musicians who know how to work with trends without compromising the core sound and principles that made FLA one of biggest industrial and EBM bands to date.